Named after the famous Stealth fighter bomber because of its angular shapes and black livery, Swiftech' Stealth is a VGA water-block designed exclusively for nVidia's high-end GeForceÃ¢â€žÂ¢ 8800 series graphics cards. At the time of publication, the Stealth is compatible with the 8800 GTS, GTX and Ultra models. 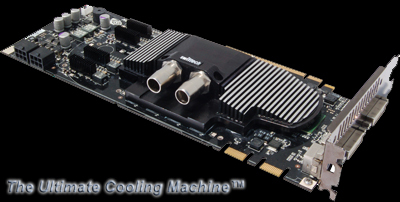 Using the same core cooling technology as the ApogeeÃ¢â€žÂ¢ GT and GTX CPU water-blocks which are recognized as the best performing water-blocks on the market, the Stealth unique design approach focuses cooling where it is most needed: at the GPU level; with its extended wings covering the memory modules and NVIO chip, the massive aluminum housing also maintains the lowest possible temperature of these surface mount components; this allows in effect for the most advanced overclocking techniques which are necessary to take core and memory frequencies well beyond factory specifications.